Mangrove forest conservation is not just a collection of mangrove plants in protected by the government. This forest is also a tourist attraction and a place for recreation by young people of Bali. Mangrove forest conservation located at Jalan Jalan By Pass Ngurah Rai, Denpasar, Bali Indonesia. This forest is very broad and become protective land in South Bali region. Not many people know this place, but this place be a very nice place with a recreational sport. Bali young people into this forest as a place of tranquility, with a very fresh air, quiet, no pollution source. Mangrove forest conservation in South Bali very broad, ranging from Ngurah Rai Airport to the Port of Benoa. The government plans to reclaim the bay in the mangrove forest. Transform this area into a region of hospitality and education. But benoa bay reclamation plan was rejected by the majority of Balinese people. For being able to destroy mangrove forests and ecosystems that have been grown in it. Mangrove forest conservation in Denpasar is very unique. 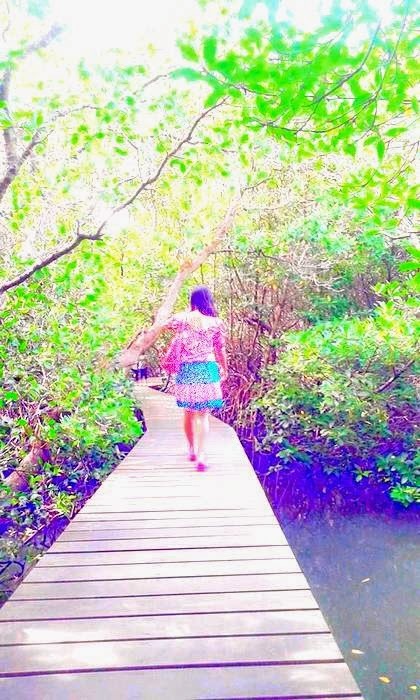 To go into the woods, has provided a bridge of wood that allows visitors to get to the middle of the mangrove forest. The wooden bridge is built and maintained by the government. Although the wooden bridge in the mangrove forest condition is getting old and frail, but visitors continue dating. Undeniably, there are nuances in the middle of the mangrove forest is very soothing to the soul. The sound of birds and animals become sedative soul. If you people are not strong enough to walk away, it is not advisable go into the middle of this Huta. Fatherly path walk into the middle of the mangrove forest is very long. In the middle of the mangrove forests no merchant. So, visitors should bring drinks and food. When walking on a wooden bridge, on the left and right of the bridge there is a mangrove tree with roots that grow out of the mire. The roots of mangrove trees to be protective to the mainland in order to avoid abrasion caused by ocean currents. Mangrove plants growing in a swamp on the seafront. Mangrove plants also become a bird and fish life. Many young couples who visit this mangrove forest. Among them utilize the mangrove forest as a place to flirt. Suasa quiet and peaceful it is suitable as a place for dating. Although sometimes there are people who pass, they are not ashamed of making love in the mangroves. When the atmosphere is quiet, they would kiss, when anyone passed, they would pretend to be silent. Poor condition seen around a wooden bridge in the mangrove forest. Many garbage piled up. Plastic trash, leftover food, bottles, cloth, and so on. Most likely the waste comes from visitors who throw litter. Sometimes there is social action carried out by environmentalists. They came with a lot of people cleaning the mangrove forests. Taking trash scattered in the jungle. No matter the hands become soiled by mud. Action as is often done. Even some of the more routine organizations to take action to clean up the mangroves.